As I say every year, I thank God for the St. Michael’s Conference for Youth, and also Thank God it is over for another year. It has been a great week, which I can write with confidence even though I am writing this before the week even begins. I can say this in anticipation of the week because every year it is a remarkable time of prayer, fellowship, and faith-building, as it has been for the last twenty years at the Midwest Conference, and the two years on staff at the East Coast Conference. 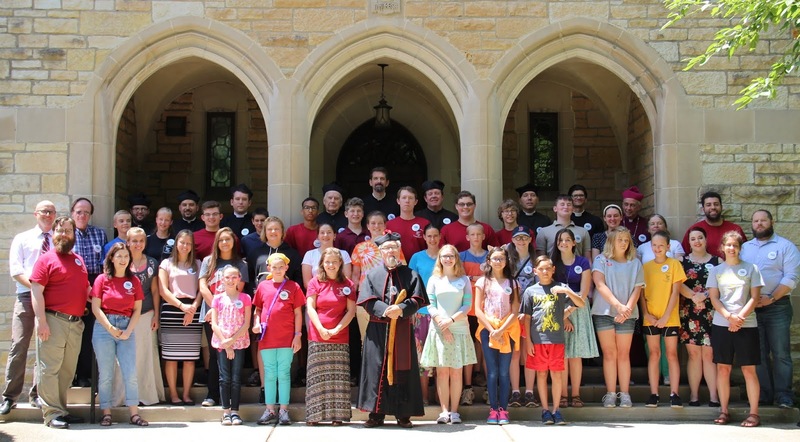 This year we had many new Conferees joining us – 12-year-olds attending the conference for the first time. And amazingly, one of the 12-year-olds attending the conference is the daughter of two people who were high school age attendees at that first conference I was working at in Shrewsbury, Massachusetts in 1993. That was a good week for me because at the end of that week I met my wife Jennifer (she came back to visit as an alumnae the last evening), and those two high school kids would eventually marry. He was the son of my wife’s parish priest in Sturgis, Michigan, and she was the daughter of the priest in Swartz Creek, Michigan. Her dad would, a few years later, start the Midwest Conference! It is a small interwoven world! St. Michael’s Conference has been lovingly referred to as Anglo-Catholic Boot Camp. The schedule is rigorous: Solemn High Mass every morning, three classes in the morning, free time in the afternoon, Solemn Evensong every evening, discussion groups after dinner, and then a fun evening activity, ranging from square-dancing to various games made up by the counselors to combine team building and learning. The day winds down with Compline (the nighttime prayer office of the church) and the kids go to bed tired, but happy. We have one purpose for the St. Michael’s Conference: to teach the Conferees about Jesus and help them to love Him and His Church. In fact, on the first day, Father Director tells the kids that they are not there to have fun. They are there to learn about Jesus and his Church, and to become good churchman. But if they put first things first, they will in fact have fun and make great friends. This has proven true year after year. Thank you to the many members of St. John’s who have supported the conference with their prayers and financial contributions. Both of these are absolutely vital to the continued success of the conference. We are training up the Church of today and the future, and the hope for the continuance of traditional Anglicanism rests on this and future generations learning the Truth about Jesus Christ so that they can embrace it, and share it.